This year is a case in point. The Head-to-Head Fund's per game probability score is at an all-time high, but so is the TAB Sportsbet bookmaker's, so much so in fact that the Fund's running at a loss. Another aspect I was keen to explore was the relative efficacy of Kelly-staking versus Level-staking and of wagering on Home teams only or on Home and on Away teams. We see that Kelly-staking of identified Home team opportunities has been profitable in every season except 2008 and to such a large extent that it could more than cover the losses that would accrue to Kelly-staking of Away team opportunities too. The picture for Level-staking is similar at least in terms of Home team only wagering in that it exhibits the same pattern of profitability as that for Kelly-staking. Away teams wagering, however, destroys Level-staking profitability in two more seasons. Comparing the returns to Home team only wagering we find that Kelly-staking is clearly superior to Level-staking in two seasons, inferior in one, about the same in two more. Overall, Kelly-staking has generated an ROI almost 1.5% points higher than Level-staking. I'd call that a narrow win to Kelly-staking. What then of the relationship to probability scoring? What we find is that, as for head-to-head wagering, profitability does not require an algorithm to record probability scores that are superior to the bookmaker's, merely that they not be too dramatically inferior. Recall that the bookmaker's probability score in line betting will be zero so the negative per game probability scores shown in the table above imply inferior probability scoring by the Line Fund algorithm. Nonetheless, profitability has been recorded in three of the four seasons for which the probability score has been negative for the Line Fund algorithm. Only in 2008, where the per game probability was 0.045 lower per game than the bookmaker's zero, was a loss recorded. As well, in 2007, where the Line Fund algorithm produced a positive probability score, the ROI was at its highest. 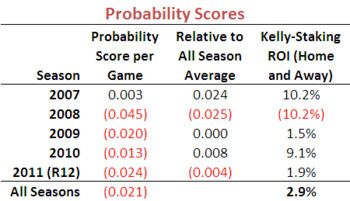 Based on the evidence here it appears that a profit is possible with probability scores of about negative 0.025 per game or higher. Why is it that, on head-to-head and on line betting, profit can be made with poorer probability assessments? I think it's due to the asymmetries in the punting-bookmaking relationship, by which I mean that the punter is not required to wager in every contest but the bookmaker is required to set a market for every game, and that an error of 1% or 20% is of no additional consequence to the punter if, for either errant assessment she doesn't wager.